Clydagh is a rural area south-west of Headford town in Co. Galway. It nestles on the north-eastern shore of Lough Corrib, the second largest fresh water lake in Ireland. Primarily a rural farming community, but within 4 kilometers of the town of Headford and 20 kilometers north of Galway city it is a vibrant, growing community. Tourism and angling feature strongly in this scenic place. Read more of the background and history of the area in the recently published book – “of Beauty Rarest“, a history of Clydagh National School and Community. While Clydagh is a townland in its own right, extending outwards as a major headland into Lough Corrib, the name of the area known as Clydagh encompasses several townlands in the civil parish of Cargin. 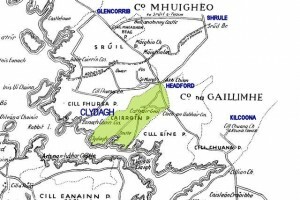 These townlands formed the core of a landed estate of some 1400 acres centered around the Georgian mansion, known as Clydagh House which still stands today in 140 acres of woodland and parkland on the lake shore. The estate was owned for over 300 years by members of the Staunton and later Lynch-Staunton family. 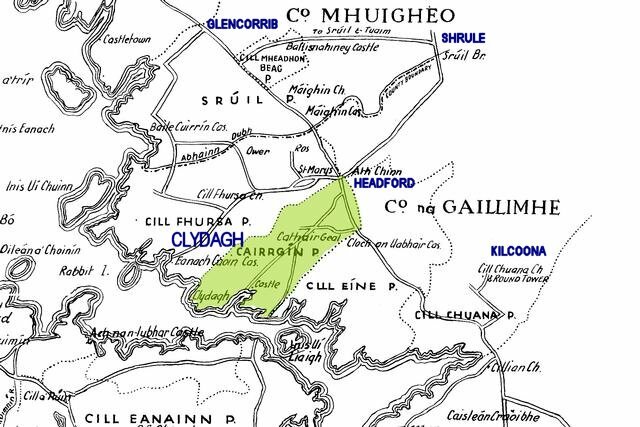 Clydagh Estate consisted of the townlands of Clydagh, Kilbeg, Ballynacregga, Cargin and Luggawannia. These today still form the heart of Clydagh. The area has its own National School, founded 150 years ago by the local landlord, George Lynch-Staunton and the present building dates from 1951. It replaced an older building which stood for over 100 years adjacent to Cargin Cemetery on a hillside overlooking Lough Corrib. Several hundred meters south-west of the cemetery stands the splendidly restored Norman castle of Cargin. Dating from the late 13th century, it was restored in the 1970s and once more dominates the lake from it’s high vantage point. Offshore, in Cargin Bay is situated the island of Illauncarbery, now overgrown but which contains an ancient stone ringfort, still substantially intact and which probably dates from a period before the birth of Christ. Kilbeg Pier is a short distance away and it marks the narrowest point of Lough Corrib, being but a half mile to the farther western shore. It was a stop-off point for Steamers that plied their trade on the Corrib, between Galway and Cong, in the 19th century.